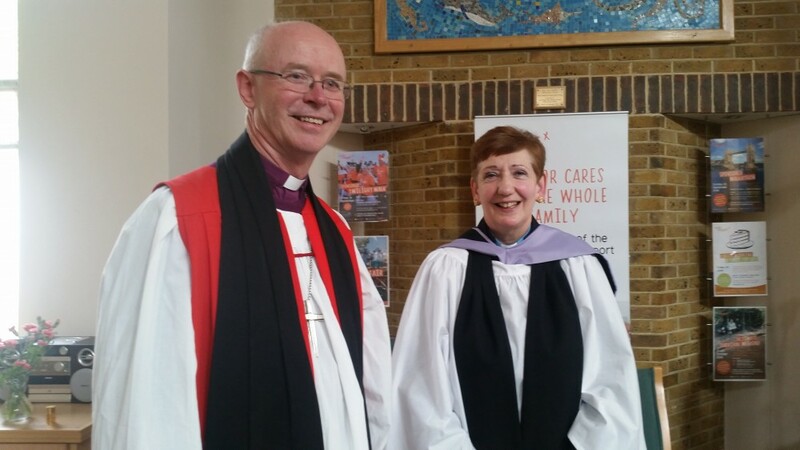 A service was held at ellenor Gravesend on the afternoon of Friday 20 May to commission Reverend Elizabeth Chapman as the chaplain of ellenor. The service was led by The Right Reverend James Langstaff, Bishop of Rochester, and attended by a number of other clergy and guests, as well as ellenor staff and volunteers. At ellenor, spiritual care is available for anybody and Rev Liz and her group of volunteer chaplains provide support to families about any spiritual matter, regardless of their background or beliefs. They are there to offer a listening ear, as well as to help discuss the big questions about life and death. The patient and family support team at ellenor offers counselling and various therapies, as well as spiritual and emotional care. A key part of the chaplaincy role at ellenor is to provide a place of support for staff, as well as patients and their families. Rev Liz has been an ordained Church of England Minister for seven years with three years previous end of life care experience working as chaplain to the Pilgrims Hospice Canterbury, and as part of the chaplaincy team at Maidstone Hospital. She has also served as curate at St Mary Magdalene Church, Gillingham. Rev Liz originally trained as a nurse and has worked in an ambulance control room, in a bank and for a housing association.